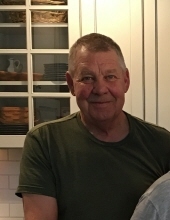 David L. Severson, 63, of Polk City died December 3, 2018 at Broadlawns Medical Center in Des Moines. A service will be held Saturday December 8, 2018 at 3:30 pm at St. Petri Lutheran Church Chapel. David was born on May 5, 1955 in Story City to Rueben G. and Rosella B. (Mortvedt) Severson. He had worked at Casey’s in Polk City for the past 10 years manager of the deli. David loved to go camping, play horse shoes and enjoyed watching the Iowa State Cyclones and Iowa Hawkeyes on tv. He is survived by two daughters, Heather (fiancé J.D. Gray) Severson of Stockdale, TX and Ashley (Dustin) Schroeder of Houston, TX; a grandson, Corbin; three sisters, Beth (Dale) Naylor of Mesa, AZ, Mary (Mike) Ness of Story City and Jane Severson of Ames; a brother, John Severson of Loveland, CO; his nieces and nephews, Jill Ness (Peter Rafferty) and their children, Truman and Baxter, Marc (Jenni) Ness and their children Braeden, Mae Leigh, and Shae Lynn), Melissa Ness (James Ulwick) and their child Winnie and Zoe (Justin) Shill. In lieu of flowers a memorial has been established in his name. To send flowers or a remembrance gift to the family of David L. Severson, please visit our Tribute Store. "Email Address" would like to share the life celebration of David L. Severson. Click on the "link" to go to share a favorite memory or leave a condolence message for the family.